Every year in the United States, multiple large-scale foodborne illnesses become national news. Restaurant food safety management is crucial to avoiding these illnesses. From contamination, to storage temperatures that are too high or too low, and facility and employee problems, there is no comprehensive database to collect data on such violations. However, a recent University of Maryland (UMD) startup called Hazel Analytics has stepped up to fill this void. The Hazel Analytics team has created an advanced data analytics software platform, FSI: Food Safety Insights, built on top of the nation’s largest database of restaurant inspection data to help restaurant managers access, understand, and track food safety data related to their restaurants. The company was cofounded by UMD Professor of Computer Science Ben Bederson, UMD Professor of Economics Ginger Jin, University of California Los Angeles (UCLA) Professor Philip Leslie, UCLA MBA graduate Arash Nasibi, and UMD students Alex Quinn and Ben Zou who were involved in developing the early critical architecture and analytics algorithms used by Hazel Analytics. 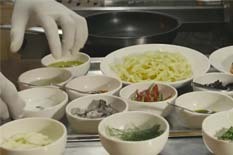 Restaurant chains, especially those with broad geographic localities, often face significant challenges collecting and interpreting data from inspections, largely because local governments perform food safety inspections, yet a comprehensive database that collects and aggregates data from companies across the U.S. does not exist, and there is no standard format for food safety inspection data. Support for Hazel Analytics’ early research came from the Alfred P. Sloan Foundation and Maryland’s Technology Development Corporation (TEDCO) program, where the team is currently participating in Phase 3 of the Maryland Innovation Initiative (MII) program. Hazel Analytics licensed technology from UMD via the Office of Technology Commercialization (OTC). Since the company’s founding in 2015, Hazel Analytics has seen tremendous growth in its customer base, with several paying major restaurant brands using their Food Safety Insights platform. The team aims to build on their momentum and to continue obtaining customers in the restaurant and insurance industries as well as expand their analytic approaches to related regulatory sectors. Hazel Analytics also plans to expand its reach internationally, where the same value can be provided to combat food safety risks. To learn more about Hazel Analytics, visit hazelanalytics.com, or follow the company on Facebook and Twitter (@hazelanalytics).